As students study the Holocaust, they frequently—and understandably—struggle with understanding not only how the Holocaust was able to happen, but also why and how genocide continues to occur in the world, and what has been, and can be, done to prevent such atrocities from occurring. This multipart resource is intended to help teachers support students’ understanding of genocide in the context of their Holocaust education. Why is it valuable to teach about genocide in the context of learning about the Holocaust? • The Holocaust is often considered to have given rise to our conceptualization of the term "genocide," which was coined during the Second World War, in large measure as a response to the crimes of the Nazis and their collaborators. Therefore the Holocaust can be an effective starting point and the foundation for studying genocide. • Students can sharpen their understanding not only of similarities between events but also of key differences. In so doing, it may be an opportunity to better understand the particular historical significance of the Holocaust, and how study of the Holocaust may contribute to our understanding of other genocidal events. • Students can identify common patterns and processes in the development of genocidal situations. Through the understanding of a genocidal process and by identifying stages and warning signs in this process, a contribution can hopefully be made to prevent future genocides. • Students can appreciate the significance of the Holocaust in the development of international law, establishment of tribunals, and attempts by the international community to respond to genocide in the modern world. • Students can gain awareness of the potential danger for other genocides and crimes against humanity that existed prior to the Holocaust and continue to the present day. This may strengthen an awareness of their own roles and responsibilities in the global community. The most important first step is to define genocide. This video provides an overview of the legal definition of genocide, some historical examples and testimonies, and reasons why the study of genocide is relevant to students today. 1	Glossary of Essential Terms: This resource includes definitions of essential terms to help frame an introduction to genocide, providing students with language to discuss complex issues associated with genocide. Many of these terms are also found in the Audio Glossary. 2	Examining the Stages of Genocide: The framework for this resource is Gregory Stanton’s “10 Stages of Genocide.” Each stage is defined, and accompanied by 2-3 testimony clips that illustrate each stage as it occurred in different genocides. Also included are “preventive measures” alongside the definition of each stage of genocide so students can see potential positive actions, as well as guiding questions to support learning and understanding. 3	Additional Resources: These resources are separated into three categories: resources for activism, resources for further study of genocide, and resources to learn more about specific cases of genocide. Note that what one defines as genocide can be highly controversial. The case studies included here are not meant to be a definitive list; rather, they are drawn from the testimonies in USC Shoah Foundation – the Institute for Visual History and Education’s archive. • A central tenant of the Echoes & Reflections methodology is the use of primary source materials, which we have provided in the form of visual history testimonies. Learn more about the Echoes & Reflections pedagogy here. • To help guide lesson planning, consult Using Visual History in the Classroom, which provides guidance on effective classroom use of testimony. • Teachers seeking a more comprehensive study of genocide through testimony are encouraged to explore full testimonies and other teaching materials available in IWitness. • One of the biggest challenges in teaching about genocide is the upsetting nature of the material. As this is meant to be an introductory resource, the testimony clips included here avoid some of the most graphic descriptions of genocide. This resource includes definitions of essential terms to help frame an introduction to genocide, providing students with language to discuss complex issues associated with genocide. Many of these terms are also found in the Audio Glossary. Mobile Users: You’re only seeing part of this page. To view all available materials, please come back using a tablet or computer. See you then! 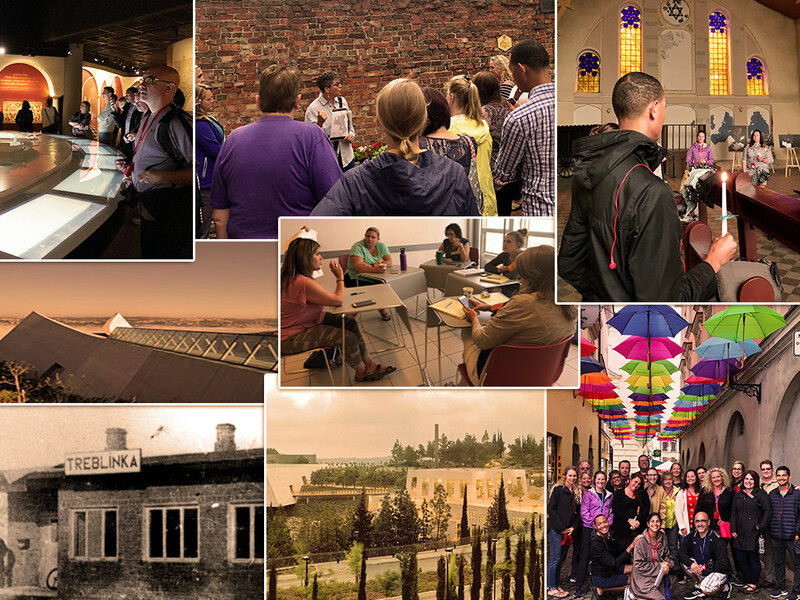 Echoes & Reflections offers two outstanding international advanced learning programs for educators who are seeking to deepen their learning and understanding of the Holocaust and strengthen their knowledge and skills to effectively teach this history to their students. These programs are open to U.S. middle and high school teachers who are actively teaching with Echoes & Reflections in their classrooms. 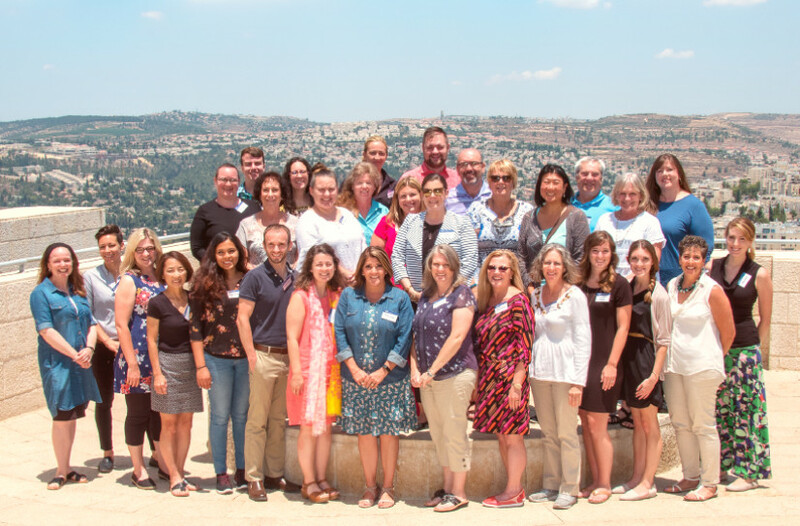 Educators selected to participate in this ten-day intensive learning experience are taught by some of the world’s most experienced and respected Holocaust educators and historians. Located on the campus of Yad Vashem, the World Holocaust Remembrance Center in Jerusalem, participants are taken on expertly guided tours of the Yad Vashem museum and the campus and engage in pedagogical workshops, daily lectures by senior historians, and group work. The seminar also provides participants with guided trips to some of Israel’s most famous historical and cultural sites to enhance their understanding of the Jewish story and provide perspective on the life that was built after the horrors of Hitler’s genocide against the Jews. In 2019, the Advanced Learning Seminar will take place from July 8 – July 18, 2019. 35 educators will be accepted. Tuition, meals and hotel costs in Jerusalem are 100% subsidized by Echoes & Reflections. Participants will also receive reimbursement of up to $1000 for their airfare to Israel. Applications for the 2019 Seminar are now closed. Thank you! 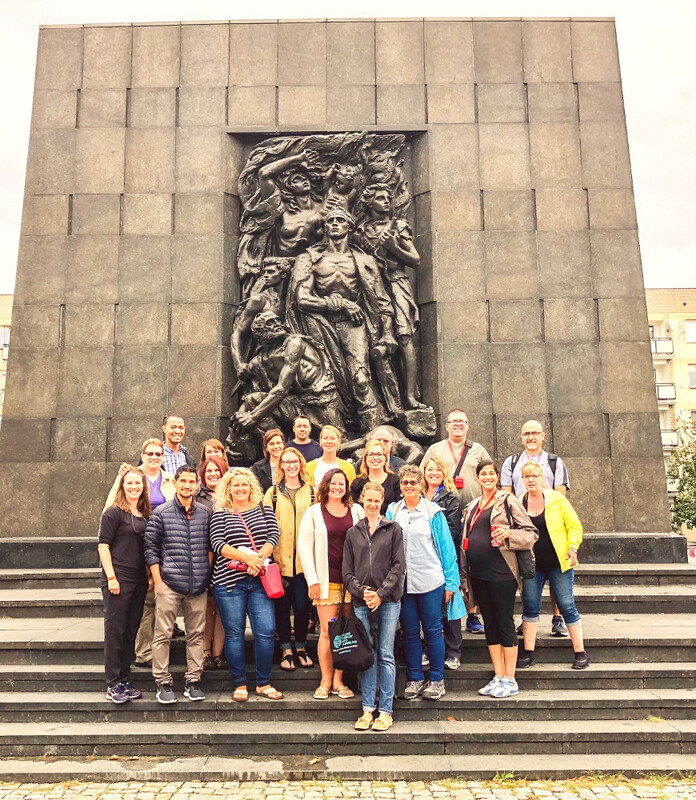 This powerful five-day, six-night Journey through Poland enables participants to learn extensively about the Holocaust in the very places where its atrocities took place. Participants are expertly and sensitively guided through ghettos, deportation points, concentration and death camps to provide them with a grasp of the Jewish life that was lived and lost. Echoes & Reflections resources, including survivor testimony as well as artistic and poetic pieces, are used to enhance and broaden the experience. Auschwitz-Birkenau, the largest of the extermination camps of the Holocaust. In 2019 the Journey will take place from July 27 – August 2, 2019. Participants must arrive in Warsaw by the afternoon of July 27th for the group’s first meeting that evening. Tuition, meals, hotel and transportation costs in Poland are 100% subsidized by Echoes & Reflections. Participants will also receive reimbursement of up to $1000 for their airfare to Warsaw. Applications for the 2019 Journey through Poland are now closed. Thank you!